We share game information in a variety of locations, and one of the newest is @WarcraftDevs on Twitter. To help keep you updated on all the notable posts going out from that account, we’ll be copying them here for your enjoyment! Keep watching this thread, and follow us at @WarcraftDevs. @WarcraftDevs: Patch 6.1 brings changes to the queuing system for Ashran. We'd like to hear about your experiences with the update. @WarcraftDevs: Known Ashran issue: Cannot whisper or invite players from other realms in your group. Fix is in-progress--will require restarts. @WarcraftDevs: You do not need Highmaul progress in order to unlock Foundry Mission caches. It’s an alternate method, but not required. @WarcraftDevs: Hotfix applied: "Music Roll: Totems of the Grizzlemaw" now plays the correct Grizzly Hills track. @WarcraftDevs Chance of a swifter respawn on lumbering ancients for the music quest? [email protected] Hotfix just went in for this. Also the music roll in Tyrande's room changed to respawn more quickly. There have been no recent changes to the rate of follower items from salvage crates. We're looking into this, but the fix may require a client-side patch. The two factions were avoiding each other in Ashran. We are altering rewards to encourage competition. pandaren aren't getting the double stat buff from feasts in 6.1. Bug? Yes, this is a known bug. Option to disable realm names on nameplates? @WarcraftDevs http://i.imgur.com/KVvRlR4.png Really annoying. We're working on a hotfix for this. It's an intended change of Spirit trinkets. We're aware it affects Mistweavers and Holy Paladins more so than others. It's a bug, thanks for the report! Please make a post and explain your intentions in hunter/feral buffs in an pvp environment.The burst is just crazy. We're monitoring how recent damage increases are affecting PvP and we'll make any adjustments accordingly. You can obtain a permanent mining speed bonus from a treasure in Spires, and the coffee buff now stacks! If a new boat phase is beginning clearly after Iron Fury was in effect, it sounds like a bug. Curious to hear more. With the changes in Everbloom, are you expecting people to be able to beat the current realm/world cm times? We may need to clear the leaderboards and/or adjust target times to keep Everbloom CM competitive. We’re discussing. Can't use my Chauffeured Chopper on my brand new Panda Monk the tool tip says "you are not the right faction for this mount"
Mounts (code-wise) don't support a non-faction, and these mounts are also visually faction-specific. Unlikely to be changed. "Exploration Mission Master" removed from "Don't Call Me Junior" meta achievement. UI not updated until a client patch. Traders who visit your Garrison will maintain the same order that started on 2/27: ore/dust/cloth/leather/herb. More players per team and longer matches results in less games played, and lower ratings compared to other brackets. Those mounts are character specific and the favorite feature is account wide. @Holinka Seems like the DRs for CC are now always 15 seconds rather than 15-20, feels like a huge buff for comps like RMD. intended change? It is intended that it always resets after a fixed amount of time, but it should be 18 seconds; we'll get this fixed. @WarcraftDevs Will Garona Halforcen trigger Ally of Argus as well as Child of Draenor? Would be annoying as alliance if not. She’s considered a Draenei for the purposes of Alliance-side traits. @WarcraftDevs A bug on the DMF's race: sometimes when you hit a post, you get an extra toll. Climb to the blue post and u get 3->5 tolls. When you hit any post, you get your first Toll for the next race segment, in the same way that you start the race with your first Toll. The achievements have been tuned with this in mind. It adds a bit of slush room for when you hit each post, knowing that as long as you get it before the next toll occurs, your toll timer will be restarted. @WarcraftDevs Forlorn composer not giving me a speech bubble or dialog for music roll. Night Elf. Tried resetting, relogging, no add ons. Make sure you’ve completed the Bringing the Bass quest, and you don’t have this track in your bank or bags anywhere. We're hoping to have this addressed in a future patch. For now, try toggling nameplates and/or using a '/tar Jessica' command. @WarcraftDevs Where are the `Real Big Race` on Darkmoon Faire? not added? bugged? And what about other mounts for this event where are they? This is an unfortunate bug that we can't fix until a future patch. Intended. They give players w/ an Alchemy building useful potions w/o flooding the AH; a different name was planned but didn't make it. This has been hotfixed. Thank you for the report! @WarcraftDevs Is there anywhere I could find math on Leech or how it works for specific classes? @WarcraftDevs Is shuriken toss auto attacks still 80% damage? Seems like it should be 100% for combat with new draenor perks. Shuriken Toss auto-attacks are actually 65% main hand, 75% offhand and have been this way for two years. No perks affect it. Appreciate the report! We'll investigate this issue. @WarcraftDevs Stampede in Lone Wolf seems to be bugged if used with Glyph of Stampede active. @WarcraftDevs Monks Power Strike talent seems to have a sporadic cooldown. It says 15sec but it comes off cooldown sooner. Is this Intended? It’s not a cooldown; you get a charge of it every 15 seconds, so that it doesn’t matter if you don’t use it immediately. @WarcraftDevs Tablet of Ghost Wolf's bonus speed now only last a few seconds after using Ghost Wolf, then normal speed again. Intended? Sounds like there might be a bug with that. We'll investigate it. We’re already working on a hotfix for this and hope to have it addressed soon. Feral Spirits only has a 2 min c/d so intentionally doesn’t reset. Ascendance does for Ele/Resto but not for Enh; fix incoming! This is a bug which we’re investigating. Thanks for the report! @WarcraftDevs @WatcherDev Old pandaria heroic scenarios are scaled to 100 now? Got only 12g for timed kill, feels rewards should be better. It was just Dark Heart of Pandaria to our knowledge, and it was hotfixed yesterday. Appreciate the heads-up, though! @WarcraftDevs Gorepetal's Gentle Grasp and Peon's Mining Pick gather speed buff dont work while in bank, only when in bags. Intended or fix? Intended and they both need to be in your personal inventory to function correctly. There was a last-minute complication that prevented us from being able to hotfix it. We're still working on it, though! There were severe clipping bugs that necessitated their removal. @WarcraftDevs Winged Hourglass(680) vs Ironspike Chew Toy(680) has -54 int and -200 less spirit proc. Even 665 Chew Toy is better. Intended? PPM vs. fixed % chance. We’re avoiding that kind of distinction/direct comparability moving forward to lessen the confusion. Appreciate the heads-up about the difference! @WarcraftDevs Can you add a CD reset mechanic for dummies after you leave combat with them? Would make practicing openers less tedious. No immediate plans just yet, but we are considering improvements to dummy fights for the future! Thank you for the suggestion. @WarcraftDevs Casting Vanish during the 6sec Master of Subtlety buff will not trigger a new 6sec MoS when or if stealth is broken instantly. Sounds like it might be a bug so thank you for the report. We'll investigate this one. @WarcraftDevs whatever happened to the visual indicator for Halo that I heard about for 6.1? It's for Holy and Discipline only since they have a cast time. @WarcraftDevs Any chance of adding further clarity to Destruction Warlock tooltips to distinguish between partial/full Burning Ember usage? We recognize how confusing Burning Ember measurements can be & keeping that in mind for future revisions. Appreciate the feedback! @WarcraftDevs Serendipity does not apply stacks properly if cast quickly (Flash + SoL proc immediately after). Intended/bug? Interesting, this may indeed be a bug. We'll look into it, and thanks for the report! @WarcraftDevs @holinka Any word on if Shadowmeld for NE's is currently bugged? Unable to meld incoming CC as of this patch. Change was not intended to affect PvP but necessary to address an exploit. Working on making improvements now. @WarcraftDevs Why is Arcane Power is dispellable and paladin's wings are not? I remember them being dispellable. Avenging Wrath used to be dispellable, but dispelling it was too punishing. No promises, but we can discuss the same for AP. @WarcraftDevs Moonkin Wild Charge (Disengage) not usable out of combat. Design or oversight? Original design. It was an oversight not to change this when we changed Disengage. This is definitely a point of confusion for some players that we will be taking a hard look at changing. Hey @WarcraftDevs, lots of helms that cover the face are now broken on human females because of the 6.1 changes. Any plans to fix it? Art is constantly looking to improve helm fitting. Bug reports with specific examples/screenshots if possible always welcome. We've applied a hotfix that reduces PvP damage by 10% in response to an overall increase in damage since Patch 6.1 launched. @WarcraftDevs Noticed that elemental rune drops are different, what was the change with it? Nothing has changed. What exactly have you been experiencing? @WarcraftDevs Ah, I think I figured it out - do you get more Elemental Runes on alts if your main has finished a ring? Correct! We heard your feedback about the Legendary in Mists, and wanted to give your alts a boost this time around. @WarcraftDevs How about Abrogator Stones? Yes, this [change] applies to all of Khadgar's questlines that require a collection of raid-dropped items. @WarcraftDevs When does the 18sec window start? At the beginning of first cc, end of the 3rd cc? It'd be awesome, if that was specified. It starts each time the crowd control effect is applied (e.g. the moment the target becomes stunned). @WarcraftDevs Any Chance on Seeing 6.1 Legendary Questline Cinematic on our Garisson like other important Cinematics during lvling ? We're going to shoot for Patch 6.2 to get this added onto the list. Thanks for the suggestion! @WarcraftDevs I guess this is a given, but Warforged items are also getting +5 ilvls? (wasn't made explicit). @WarcraftDevs @Celestalon is crit chance reduced versus raid bosses? Crit chance is affected by the target’s level, yes. @WarcraftDevs thx for all the heirloom upgrades/tab. Any plans to convert existing plate to str/int like wod add int plate for pallys? We don’t currently have plans to do that. We like heirlooms being targeted to specific roles. @WarcraftDevs the rogue talent Shuriken Toss' auto-attacks only apply lethal poisens? Is this intended? Yes, only lethal poisons. This was inadvertently left out of the tooltip. @WarcraftDevs I still haven't seen any response about the Codex of Xerrath not applying to Glyph of Metamorphosis! On the radar? We don’t currently have plans to support this particular combination of visual options. [email protected] Why does the Windwalker movespeed aura not stack with the passive portion of Pursuit of Justice? @WarcraftDevs Can we get a blue post about these stealth Ashran changes? Intended? Bugged? Let us know what is going on please. Events in Ashran no longer have individual timers. Instead, an event is randomly selected to begin every few minutes. @WarcraftDevs Could it be possible for tier tokens to show warforged/socket/tertiary before they are consumed? Due to technical limitations, we don't have plans for this at this time. @WarcraftDevs Please tell me that there are plans for other uses of Draenic Stone. I have been hoarding them in my reagent bank in hope. We gave them a good sell price, but at this time there are no other plans. @WarcraftDevs Characters under lvl 100 can't see ore/herb/fur/etc. traders. By design? Alts are people too! You need a level 3 Garrison, but you can visit someone else’s to pick these quests up before then. That item is currently being revamped and will make its triumphant return very soon! @Warcraft @WarcraftDevs explain to me why my horde trinket on my rogue was normal a few minutes ago, i get into arena and now i cant use it? We’re aware that these trinkets are incorrectly being converted and we’re working on a fix. Thank you for the feedback. We'll look into it. This is correct. Apologies for any confusion. @WarcraftDevs any news about NE Shadowmeld? It is still not removing from combat since 6.1 patch. Hotfixed yesterday: Shadowmeld works normally everywhere except PvE instances (dungeon/raid) where it won't drop you from combat. This is a thing we think would be super cool! @WarcraftDevs If RAF recruit uses token to pay for subscription, does it count for reward the same as prepaid card/subscription? Any form of game time counts toward rewards for the Recruit A Friend system. @WarcraftDevs are you aware of this bug with archology? http://www.wowhead.com/achievement=9900/exploration-mission-master#comments … … Happens to me, bought a map never getting the quest! HELP! This will be fixed in Patch 6.2. @WarcraftDevs any plans to make the challenge mode gear from MoP account wide? @WarcraftDevs hi guys, love your game. wondering why there is no heirloom mount that works for new Pandaren characters, is that intended? This is a side-effect of the chauffeured mount being affiliated w/ Alliance or Horde. It’ll work once you choose a faction. @WarcraftDevs with Heirlooms now going up to lvl 100, can we have them drop from Garrosh again? Main draw of those was look/90-100 scaling. Those were a reward for doing the content when it was relevant, and there are no plans to bring them back at this time. @WarcraftDevs Could the Polished Helm of Valor possibly get a change? Both it and the Might have Haste, which the Valor set is Crit-based. Thank you for the feedback. This and other Heirloom stat changes are being addressed in an upcoming patch. Items that don't have a high stack amount are our gentle way of encouraging their frequent use. @WarcraftDevs Could you please clarify some facts about Fandral's Seed Pouch? Like drop restrictions (druid only?) etc. :) Thank you! It will only drop for a druid, and it's very rare. @WarcraftDevs Will the crafted gear be getting another stage upgrade to be on par with HFC gear in 6.2? Yes. You should see this in the near future. @WarcraftDevs Any chance the Garrison Missions for 645 player items will be updated in 6.2 for faster catch up ? We have plans for a catch-up for alts in 6.2 that are not yet visible on the PTR. @WarcraftDevs can you tell if pvp set bonuses will stay the same or change in 6.2? The set is shared between all Warlords seasons. Some may be changed, however, for balancing reasons. @WarcraftDevs Are Seals of Tempered Fate remaining the Bonus Roll currency? Does that mean we can stockpile them before HFC opens? There will be a new bonus roll currency in 6.2. @WarcraftDevs Why can't I use other people's Bunker Quartermaster to spend my Iron Horde Scraps? This is a building perk just like Inn recruitment or Barracks Bodyguards – if you want it, you'll need the building. @WarcraftDevs Any plans to make follower weapon and armor upgrades bind on account? We’re discussing future systems, but we won’t be touching the current upgrade items. Feel free to use or sell them. @WarcraftDevs If I reroll traits on Garona, only the two standard ones will reroll. Is this correct? Correct. Master Assassin cannot be replaced. @WarcraftDevs Any reason I can't watch the face-off between Gul'dan and Grom cinematic via Chronicler Kezac? We left it out of 6.1 to avoid spoilers, but you'll be able to watch it in 6.2. @WarcraftDevs Tanaan jungle, is there going to be anything similar to bloody coins on timeless isle? No current plans, though you can continue to collect bones for your sparring arena. [email protected] Will our garrison followers be upgradeable past 675, or are the ships taking their roll in this coming tier? The plan is to stick w/ 675 & we'll add in some extra-hard missions for them; Garrison progression mostly on the naval front. @WarcraftDevs Any chance for more music to garrison juke box in 6.2? Would love to hear the ICC Gunship battle music <3. No plans for this right now, but we were super happy to see how much people liked the feature and we may revisit it in the future. @WarcraftDevs Please tell me the new Breath of Sindragosa cost is a bug. It is. It will be 20 Runic Power for Blood next build. Unchanged for Frost and Unholy. @WarcraftDevs @Celestalon Now that Mythic testing is starting. Any plans on allowing us to test Set Bonuses? Set bonuses and trinkets will be available next build. We have no plans to make this available to players at this time. @WarcraftDevs Will Felblight be purchasable with primal spirits? @WarcraftDevs @Celestalon http://screencast.com/t/tSZmFrhs Are you baking in the "old"/current version of the set bonus? No. The current bonus is too powerful for a 2-piece. @WarcraftDevs Will the Mythic Dungeons have new mechanics, or will they be a scaled up version of the Heroic mode? Current PTR state isn't final. They’ll be like scaled up versions of Challenge mode w/ mechanics changes from Heroic accordingly. @WarcraftDevs Will the new seals be available from Level 3 War Mills? @WarcraftDevs are you all going to do a watercoooler for the next patch? There are several more blogs in the works that will dig into specific patch features in more depth. @WarcraftDevs Hand of Freedom works now properly or someting went wrong? (PvP). We recently pushed a hotfix live that makes Hand of Freedom no longer usable while stunned. The tooltip will be updated in 6.2. @WarcraftDevs How rare is the 6.2 conquest\honor reward mission supposed to be? Any prequisites or conditions? It'll have a small chance to trigger once you have a solid collection of high-level followers. @WarcraftDevs Tusks of Mannoroth... still in game? Yes, and they are still very rare. We will not be removing this limitation, however, we are adding new tiers of crafted gear. @WarcraftDevs Will Mythic dung lock you to instance with bosses dead like a Mythic raid? Can I help friend do one I have completed already? Mythic dungeons have a weekly loot lockout, but you can help friends if you’ve already gotten your loot for the week. We take all feedback into consideration. Whether or not we reply publicly has little to do with that. @WarcraftDevs @WatcherDev @holinka When to expect more Developer interviews or Q&A? We'll be setting some up as we get closer to 6.2 release, but don't have dates to share yet. @WarcraftDevs Any chance you guys could tweak the spines of deathwing fight to be a little more solo friendly? We don't have any plans currently to go back and alter this encounter. @WarcraftDevs is there a definite date for the new patch to come out? We haven't announced a 6.2 release date yet. Stay tuned! @WarcraftDevs Would it be possible for blood elf warlocks to get a glyph that changes their pet into a phoenix like Kael'thas summons? 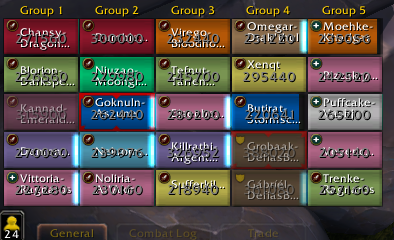 @warcraftdevs [Trailseeker Spaulders] http://t.co/DWnMQuz0CM can you fix these to actually show up? Can't currently mog 'em. We don't currently allow transmog to "invisible" shoulders. It's an aesthetic choice we've made, but we understand the common feedback. @WarcraftDevs When I right-click on a username in chat there is no option to Report them for language. Why would that be the case? @WatcherDev @WarcraftDevs Can achievements be done in Timewalking dungeons, and can the Blue Proto Drake drop in that difficulty? This is intended. We’ll have more information to share in a forthcoming blog.